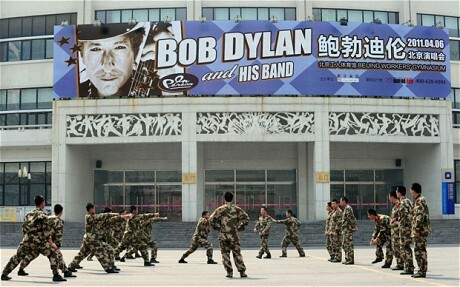 Bob Dylan will make his debut in China tomorrow, starting with a sell-out concert in Beijing followed by a gig in Shanghai on Friday. It may be that Dylan has some way to go to win mass popularity in China, though. When the Xinmin Evening News, one of Shanghai's most-read newspapers, wrote a story previewing his concert, they inadvertently used a picture of Willie Nelson. 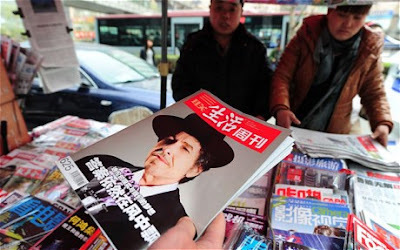 "In China, maybe many people have heard of Dylan, but not many really know who he is," said Zhang Xiaozhou, a Beijing music critic. Dylan, whose first attempt to come to China last year was reportedly vetoed by the culture ministry, is being brought in by concert promotion giants Live Nation. Read it all here. Tip of the Tinfoil to BL. UPDATE: Dylan has finished his debut concert in China. LiveBlogging was here. Thrilled of course to see he played It's All Over Now, Baby Blue. The Telegraph LiveBlog reported that he sang Gotta Serve Somebody, but that does not appear on the setlist from the ever-faithful, ever-diligent BobLinks. Can a theme be detected from the setlist? Such things are highly subjective (who knows whether he just plays a form of Refrigerator Poetry with his songs before printing out the setlist?). We see - from the very first opening song, themes of change, of turning away from the past, but not necessarily toward a glorious future either. He mixes his old with his new, including Beyond Here Lies Nothing. What is of note is that he does two encores - something I haven't seen him do in recent memory. 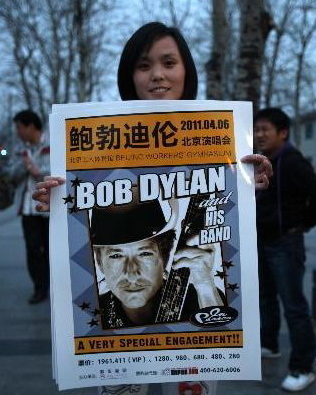 After 50 years of performing, Bob Dylan finally received a stamp of approval from the Chinese Culture Ministry and made his first Chinese stage appearance in Beijing Wednesday. 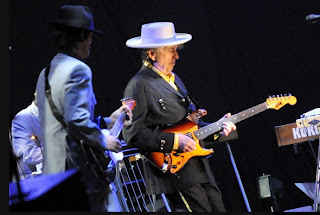 Dylan, who has been refused and had Chinese tour dates canceled in the past, played under a stipulation that he only performed approved content. In front of a 5,000-person crowd at the Worker's Gymnasium, the 69-year old singer-songwriter croaked out a 17-song set list that mixed modern and vintage pieces, ranging from the hugely popular to the virtually unknown. Highlighting the performance were famous hits "Like a Rolling Stone," "Tangled Up In Blue" and "All Along the Watchtower." Time takes a crack at interpreting his setlist, but again through the lens that he is a "protest" artist, which of course, Joan Baez pointed out he was not in Martin Scorsese documentary, No Direction Home. She remembered how people would come up to her during the 60s protest years and asked where Bob was and over and over again she'd have to say, he's not coming, he never comes. What I find interesting in the setlist is that he doesn't look forward to some glorious future here on earth either - so much for the joys of revolution. Love it that It's All Over Now, Baby Blue got through the censors. That just sort of makes one day. Obliviously the Chinese censors haven't got a clue. The folkies in Newport got it in 1966, but not so the Beijing officials who reportedly packed 2,000 minders into the concert. And so we shall dedicate this performance to them. Because we can. Here is the opening statement from a fascinating press conference held prior to Bob Dylan's concert scheduled for April 10th in Vietnam. You can see the entire three-video press conference here. 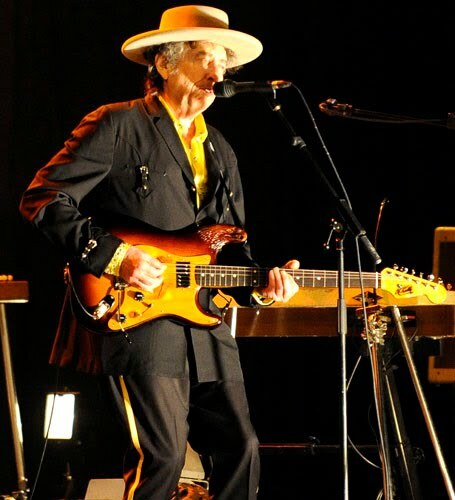 As with other concerts here, Vietnamese authorities required Dylan to submit the lyrics of songs he plans to perform for review. I can’t help wondering how Dylan went about this, both for the Vietnamese and the Chinese authorities. Did he just send them a copy of his book, Lyrics: 1962-2001 ? Of course, that would leave out his most recent songs, but they could have been printed out and appended. The mental image of these communist bureaucrats going through all of those songs, trying to figure them out, is an oddly pleasant one. Perhaps they can shed some light on Visions of Johanna. Or perhaps not. Read all of Sean's post here. You can hear an excerpt from the original recording at BobDylan.com here. Bob Dylan performs in Shanghai on Friday. Since you are too young to be a member, would you like a copy of the AARP article on your man? If so send me a message on T-19 and I'll get it to you. Love your web site and your church. Got to visit there a few Easters ago. Sorry Kelso - Hagrid has tossed you out the door. And booked you on a flight to China. Yes, Northwest Bob - I'd love it! I'll send you a message at T-19. Thank you! PS Northwest Bob - I sent you a message on SF, not sure how to send messages on T-19. Did you really mean SF?